Part of Palas State, Baie de Citron is a deep water bay in Central Irukandji. Its only landmass is a small island near its centre surrounded by a low crescent of hills, the visible remnants of a volcano caldera. Strategically and in terms of infrastructure, Baie de Citron is a very important seaway, and its facilities also proved popular with locals and visitors. For most of its life, the island in Baie de Citron was occupied by an American couple, while the waterways remained public thoroughfares for sailing regattas. The resort on neighbouring Hephaistion also extended into Baie de Citron to provide more public space for locals to enjoy. 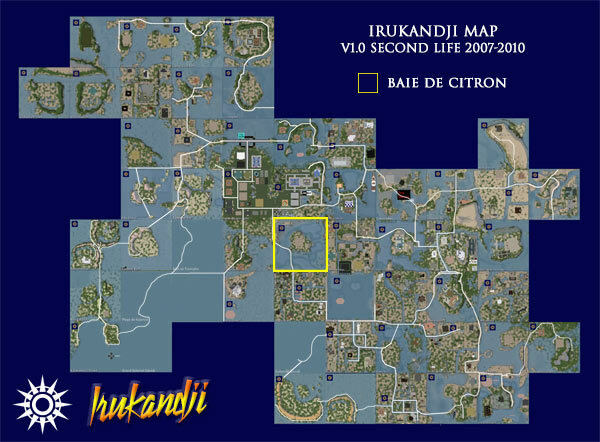 With its close proximity south of Hephaistion (later Boyfriend Beach) and diagonally adjacent to Valkyrie Shoals, home of Irukandji Police, Baie de Citron also served as an important conduit between 'old Irukandji' and the newer states to the west and northwest. During Irukandji's war with the French over the liberation of the islands of Kalamat, the deep waters of Baie de Citron proved a great asset for the the movement of large military vessels. This was especially handy when manouevering the enormous Collins Class Submarines in and through the naval base at neighbouring Split Rock Mountain, particularly submarines. A wholly underwater section of the Trans Irukandji Causeway runs north from Alantay Island to the central island in Baie de Citron, then northwest to emerge above land again at Crystal Atolls. Other simulators that adjoined Baie de Citron were Bay of Plenty, Nouvelle Kiribas, and Tamita Bay. Initially a hollowed-out hill in contour, Baie de Citron was a sunken version of Baie de l'Amore, then terraformed to provide a flat platform on which to build. The edges of the bay altered slightly over the years to compliment changes to surrounding regions, however the central island retained its shape for the rest of its life. 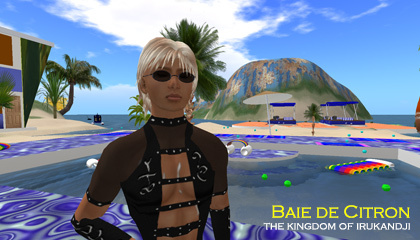 The .raw file for Baie de Citron became a popular foundation template for other simulators that followed. The name 'Baie de Citron' is taken from the real-world Baie des Citrons near Noumea in New Caledonia, a place I visited back in the late 1990s.